ANYWAYS stoked for tonight!!! Send good vibes that we somehow get picked to go backstage/dance on stage/ become best friends. THANKS. Thank you, Dooballo for making me go from bum to keeping my job ;) But seriously I did't even have to go through the pain of breaking them in because they are just already good to go! They're actually really comfortable (believe it, people) You can be cute and comfortable. They have tons of cute shoes but these just stuck out to me and I'm really happy with them! So next order of business, what do you wear to a Taylor Swift concert?! Help please! Happy Monday!! Such a cute outfit girl!!! Love it :) ENJOY the concert tonight- I know it will be amazingggggg! Thank you!!! AHH IT was AMAZING!!! awwwww so jealous!!! have the best time. Thank you!!! I love Taylor!! Omg! Wait how can you be BFFS with Taylor when she told me we were?!? Hahaha Kidding! But I love her too. I own every single album and know the words to every single song. I kid you not. Have fun!!!!!! Wait how about we can all be bffs? And hang out backstage at all her concerts, and have sleepovers! omg please!! haha That is so awesome, we will get along great! I love her!! Have you heard Permanent marker? SO good! Have fun!! 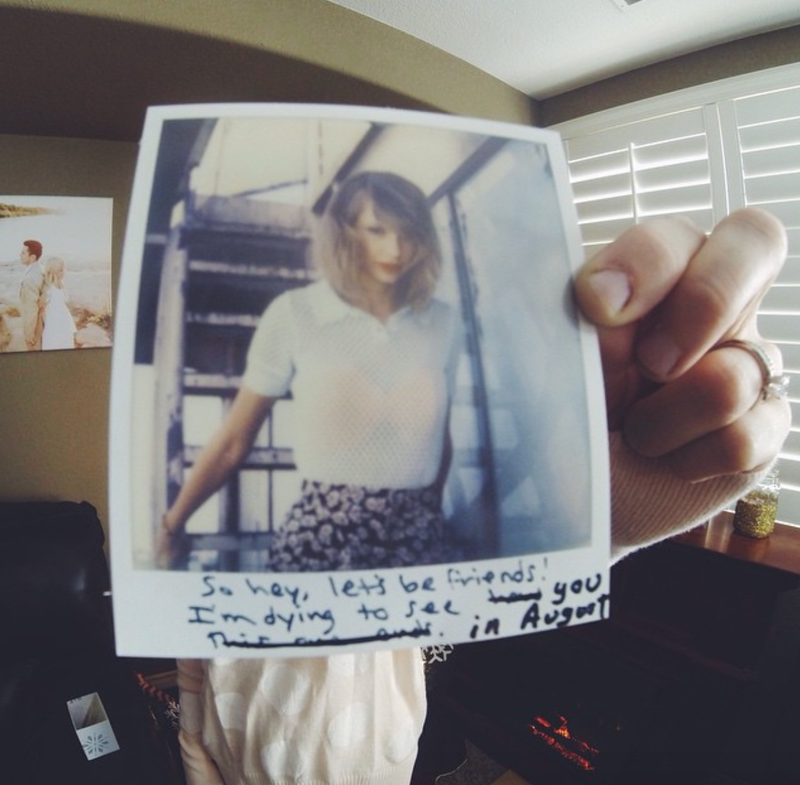 I love that he did that with one of her Polaroids to tell you! Thank you!! haha I was confused by them at first until I started reading the captions :) I love tay!! That is a long time to wait! Have sooo much fun! Are you going to cry? I went to the Hanson concert in 3rd grade and cried I was so happy. Jason seriously wins again in the gift giving department. I follow her on insta, which I'm sure you do too (duh) but she always has someone surprise...I wonder who you will see tonight! Also it's funny you're wearing this because true story, last winter I saw a picture of Taylor Swift wearing black skinny jeans and ankle boots and her legs looked sooo long so I tried it and wore the same thing for like a week straight. It works! Worth the wait omg. You were right about the crying!!! hahah I'm pathetic and obsessed but it's ok I guess. hahah Hanson would be amazing live!! I follow her insta, twitter, and I just added her on snapchat (I'm a freak) but im so excited to see her snaps haha She didn't have anyone else come this time but it's ok because she was the only person I even cared about seeing. haha I love black leggings/skinny jeans! They make anyone look like they have these perfect legs :) and the fact that Taylor wears them makes them even better now! have fun! you look great! Thank you sooo much! It was amazing! YOU CALLED IT! She's sooooo huge now!! So lucky you've seen her twice! What concerts did you go to? And thanks for that tip! I just went with what I wore in this post haha comfy but still cute I think, but swapped out the boots for sandals instead :) Thank you!!! Seriously love her so much and it was AMAZING! YOU have to go to a concert!!! That concert is going to be SO AWESOME. I can't wait to hear who she has with her...I love that fact that at each concert she brings other artists on stage with her. I think it's the coolest thing! Your outfit is adorable, I love the boots with the leggings, it does dress them up a bit. Thank you so much, Mandie!! haha I went a little overboard on snapchat but I couldn't help it! it was too good!!! I 100000% agree! She just seems like such a sweet and genuine person who stays true to herself! Seriously some of her songs have been my life anthem after bad breakups and helped me cope. Bad blood is such a perfect song for a fall out with a friend, like too perfect! She is so awesome!! THANK YOU!!!! She was AMAZING! What concert of hers did you go to?! haha good point! I do like them because they make me a little taller :) i'm only 5'2" so I need all the help I can get! I LOVE this outfit. It is so cute!! Thank you sooo much Alyx! ps I LOVE how your spell your name!